Last week I posted an excellent video from the 1980’s looking at the development boom of the time in the city centre. One of our readers later send us a link to another great old video, this time a decade earlier. The video was produced for the NZ Railways and looked at the work done on the rapid transit scheme of the day. In 1974 a committee was formed to report on Auckland’s bus and rail services. A comprehensive proposal for an integrated rapid transit system was developed. Input came from civil engineering, industrial design, construction and economics sources. The completed report is presented to the Minister of Works and the Minister of Railways. Newspaper headlines indicate the level of controversy felt in Auckland. The final headline reads ‘Government refuses further aid on rapid rail’. Had it been built it would have seen an earlier version of the City Rail Link built and the Southern Line upgraded and electrified. The other lines were potential future projects. Auckland would be a very different city today it this had this, or previous incarnations of it, been built. I really hope that someone is organising, and hopefully already filming, a documentary for the City Rail Link. So depressing that this was made the year I was born and you could pretty much have said the same things about the Auckland transport situation right up until now. 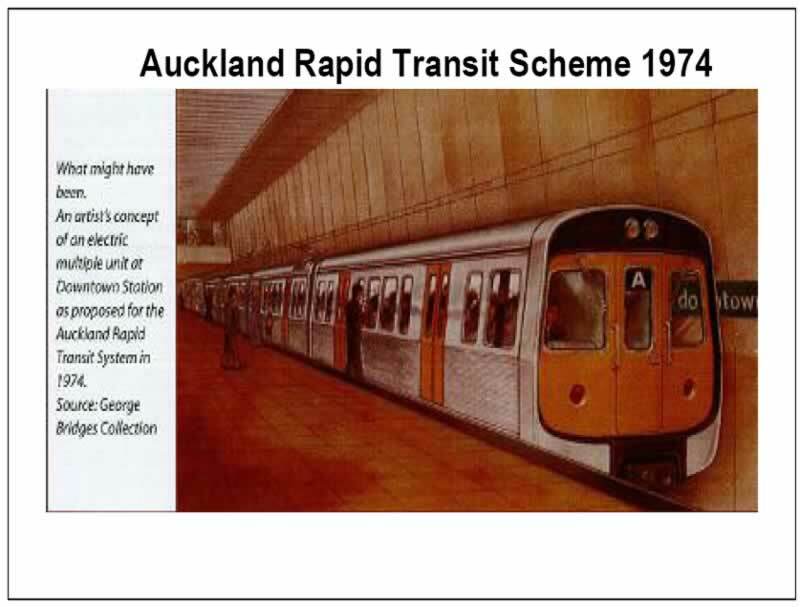 We have at least pulled the trigger on the CRL but at least 40 years too late. Unfortunately, the short sighted fools who created this situation are largely all dead or too old now to properly hold them to account. Sheer idiocy to rely solely on the private car to create a transport system. The 1975 video is fascinating viewing, if a bit soporific in places. It does, however, contain an obvious and salutary message and should be compulsory viewing for everyone involved in Auckland’s current transport debate. I have an uncomfortable feeling that some time around 2040 someone will be posting a comment similar to Goosoid’s, this time in relation to the relocation of Auckland’s port and the tremendous opportunity which was missed back in the early part of the 21st century. So 43 years ago they planned for 9 car EMUs underground? Considering that most of the rest of the plans have been followed (corridors, electrification, etc.) it would be a shame to change that now after so long. In fact it’s amazing how long this has all taken. 4 more years of construction feels like nothing now. An optimistic prediction of Auckland’s population hitting 2 million by the turn of the century! Auckland probably would have except for the mass exodus of Kiwis to Australia in the 70’s-00’s and the slowing birth rate from around 3 to 2 children over that time. It might have if we had better transport and less congestion…..
Perhaps if they had spent less time designing a logo and designing train doors and more time securing some funding they might have been more successful. Fact is they didn’t even get close to funding their proposal. Why do you think that is, mfwic? Who do you think had the other ear of government? Certainly the people of Auckland have been paying for the government’s mistake on this ever since. Was I seriously the only person who thought that film was bloody funny? They paid some dude to sit and design the doors for a train that didn’t exist and never would. Firstly it wasn’t as if train doors didn’t already exist and secondly bespoke doors are probably the last thing you need when you haven’t got a project to the start line yet. I am sure he was a very nice man and his doors might have been wonderful but isn’t that a great example of doing the wrong thing really well? No you weren’t, I thought that too. There was an awful lot of bespoke design going on for something that hadn’t been funded. Sorry for being too serious. I guess I’ve been desensitised to irrelevant trivialities by the crap that poses as educational for kids. Eg dvd’s about how a car is designed and made, in which the styling of the interior seems to be what the engineers spend their time on, etc. From what I have seen you only need two things to get a mass transit system. You need political will and you need money. These guys didn’t actually have either. They never had an approved budget and they didn’t even have the ARA supporting it. All they really had was the Mayor of a small part of Auckland. Miffy is a decent person. In person. Unfortunately the interwebs seem to bring out many people’s DEMONS. Stu has only met me on medication days. you’ve only met me when I’ve run out. Sorry about that! Yes I agree, same issue with earlier versions of the schemes too i.e. 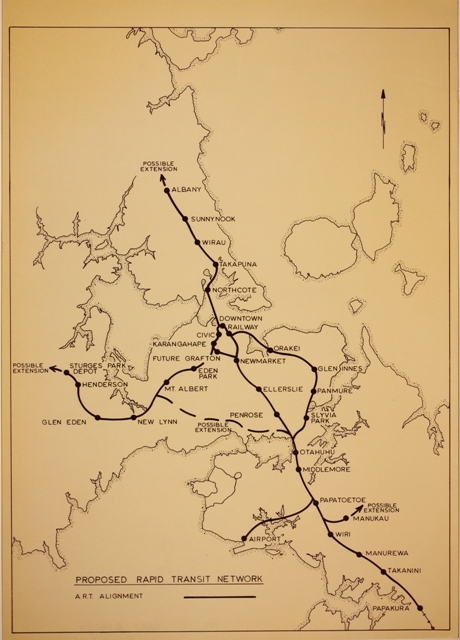 the 1920s version included tunnel and electrifying network from Papakura to Helensville which was about half the cost. Had they broken it down to stages it would likely have happened a lot sooner. According to the biography of Sir Dove-Myer Robinson, Mayor of Auckland at that time, the 72-5 Labour govt had agreed in principle to funding the project, but government finances took a massive hit once the 73 oil crisis hit. Then Muldoon won the 75 election and kiboshed it – partly because Muldoon hated Mayor Robbie and didn’t want him getting any political credit for it going ahead. Norman Kirk campaigned by agreeing to everything that was popular, he even claimed he would ‘ban the bikies’ as motorcycle gangs were unpopular at the time. But they never allocated a single dollar to constructing the rapid rail in any budget so you can’t really say it was the oil crisis, although that become an excuse for any promise they broke. They did spend up on a shipping corporation, increases to public sector salaries as well as building houses and spending more on health and education. But I don’t think a fancy train system for Auckland was ever a serious proposition for them. Absolutely comical. Half these guy look like chronic dope smokers. And the tweed suits and wide ties not to mention smoking pipes inside. I loved this video. It’s somewhat comforting that people have been looking at these issues for so long and yet still landed on very similar concepts/ideas about what Auckland’s PT system needs to look like, i.e. core network of rapid services supported by a network of connecting bus services. Seeemed so close to getting built but didn’t make it. Strange in a way with “think big” projects getting built and oil saving measures. Even part electrification of the main trunk line. Some classic shots in there. Anyone know what station that was where the woman & children get off, train barely stopped for her I think.